Boeing has upgraded its forecasts for the number of new pilots required over the next two decades as airlines boost their fleets with new aircraft and add more flights to an ever-expanding route network to meet the growing demand for air travel. 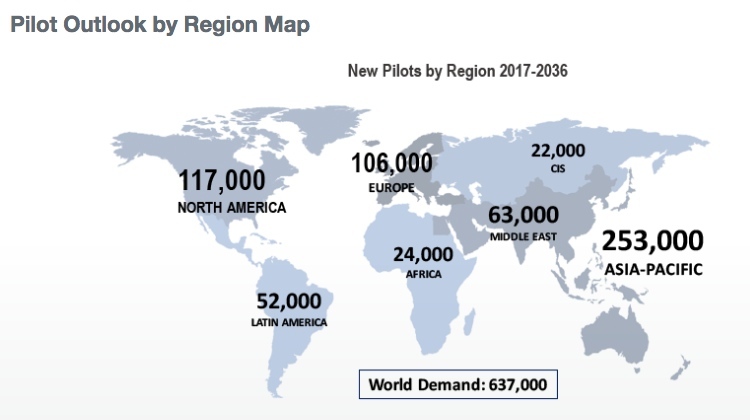 The manufacturer’s 2017-2036 Boeing Pilot and Technician Outlook, which was published at EAA AirVenture Oshkosh on Monday (US time), forecasts a need for 637,000 new commercial airline pilots around the world, an increase of 3.2 per cent from the 617,000 figure in the 2016-2035 outlook. “As global economies expand and airlines take delivery of tens of thousands of new commercial jetliners over the next 20 years, there is extraordinary demand for people to fly and maintain these airplanes,” Boeing said in a statement. 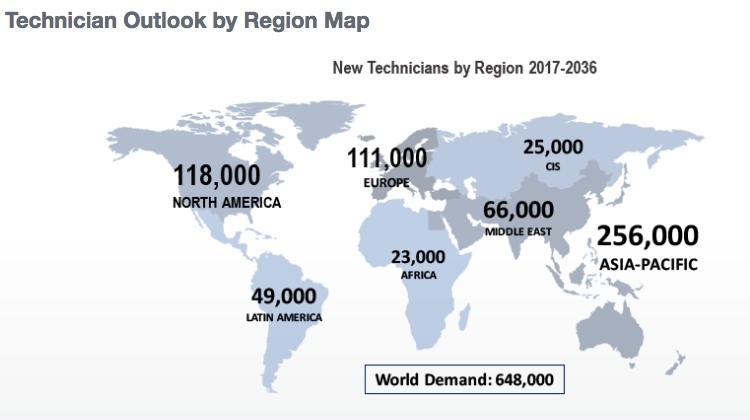 Meanwhile, the latest Outlook has lowered its forecasts for airline maintenance technicians by 4.6 per cent to 648,000, from 679,000 a year ago. Boeing said in a statement the reduction was “primarily driven by the reduction in maintenance hours required on the 737 MAX”. “Global fleet growth will continue to drive a strong demand for technicians to repair and maintain the airplanes,” Boeing said. The report also estimated there would be 839,000 new cabin crew members needed over the next 20 years. Boeing noted educational outreach and career pipeline programs would be key to attracting enough pilots, technicians and cabin crew to meet the industry expected demand. Further, the aviation industry would need to find innovative solutions to keep pace with training requirements, including immersive technologies, adaptive learning and new teaching methods. “Early student engagement and defined aviation career paths will help expand the reach to new demographics,” Boeing said. 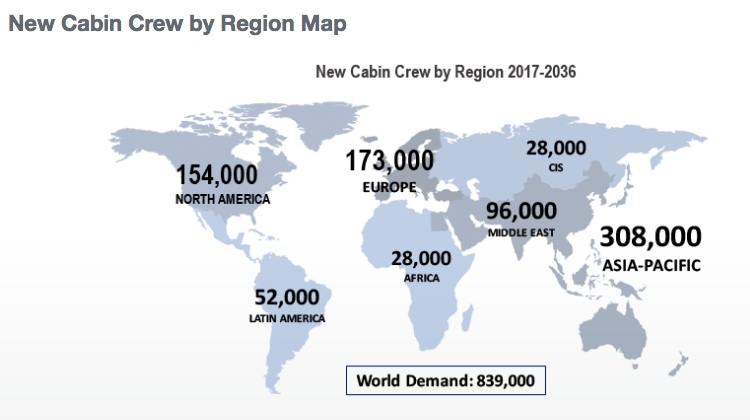 The Asia Pacific would comprise the largest source of demand with 40 per cent of new pilots, 39 per cent of technicians and 37 per cent of cabin crew to be recruited in the region between now and 2036. The strong demand in the Asia Pacific was currently being met by qualified pilots from outside the region, attracted by the relatively higher wages and conditions on offer. Also, Asia Pacific airlines were sending pilots to overseas aviation schools in Australia, Europe, the United States and elsewhere to gain their qualifications while establishing locally-based flight schools as part of efforts to boost aviation training capacity to meet the expected demand. The report from Boeing Global Services is now in its eighth year. Boeing Global Services is a recently-formed arm of the aerospace giant that brings together its previously separate aerospace and defence services in supply chin management, engineering, modifications and maintenance, digital analytics and training. It is the company’s third business unit alongside its Commercial Airplanes and Defence, Space and Security. Boeing and Virgin Australia’s joint Brisbane facility is home to five full flight simulators. This information has been forecasted 10 years ago and again 5 years and again 2 years ago. However, it seems that more pilots are leaving the industry or retiring and no one to replace them. it also accounts for a large amount of drop out trainee who unable to fund their training. This forecast would be a correct and good estimation. Unfortunately, this number will keep growing and growing each year as the number of pilots retiring is greater than the number of pilots ready for the job. Remember it takes 18 months before a CPL holder is ready with min 25o hrs. no that’s not right, Oliver – I read somewhere that some of the new ‘oriental’ flying schools were training high school graduates and that they were ready to slip the surly bonds in just about no time at all…. well, that’s not entirely accurate – but on the other hand….. The forecast must be for pilots of a minimum standard, so it excludes pilots who are already trained and experienced, but who are deemed unsuitable by airlines because they are not: (i) ‘culturally fit’ (=religion) – i.e. don’t have the mystical pilot X-factor (e.g. scootitude?!) which a airlines are looking for; (ii) mentally fit – i.e. don’t pass the DSM worldview (=religion) of mental health; (iii) physically fit – i.e. deteriorating eyesight or other anatomical wear’n’tear; (iv) technophobic – i.e. don’t trust and/or don’t like the highly automated electronic & computer systems of modern aircraft. Like most other industries, these forecasts are probably also a political manipulation tool to pump up the wages of pilots by creating the appearance of a short supply. If supply really was short, then airlines (or governments) would be paying for pilot training (which should be the default norm anyway). 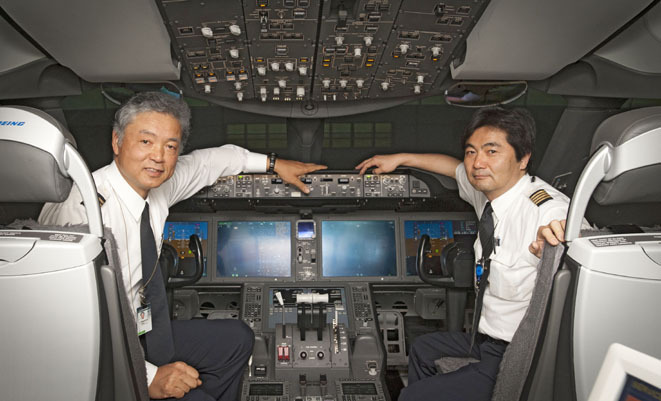 The fact that many would-be pilots – like myself – have never been able to afford training shows that there is still an abundance of Pay2Fly suckers out there willing to risk the enormous investment in training without even knowing whether they’ll be employed at the end… and apparently many are not!